Cambridge & Coleridge Athletic Club has a Wheelchair Racing group. Beginners are welcome – no experience is needed. All the athletes in the group started as complete novices and are now racing anything from 100m to half marathons. The club has five racing chairs, along with helmets and gloves, for use by new athletes. The wheelchair section currently has three coaches and five athletes of differing experience and speed. 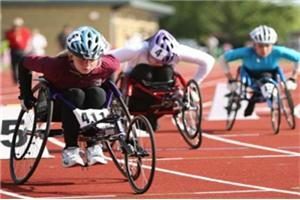 Wheelchair racing is open to anyone aged 14+. Sessions are delivered by UKA-licensed Athletics Coaches. The nature of the discipline means athletes will have a physical disability that affects their lower limbs, although they may not use a wheelchair all of the time. Wheelchair racers include people who have disabilities such as Cerebral Palsy, e.g. Diplegia, Quadriplegia, Spinal Cord Injury (Tetraplegia & Paraplegia) as well as Amputees, people with Limb Deficiency and Brittle Bones. Anyone interested in trying out wheelchair racing should contact Neil Costello. E: wheelchairs@cambridgeandcoleridge.org.uk to ask for more details or let the group know you are coming. Wheelchair Dancing sessions run at St Neots on Monday nights and are open to children and adults and classes are for all levels of mobility and all types of wheelchairs. Class one, from 5.15 to 6pm, welcomes carers and family members or friends to assist if needed. Class two, from 6.30 to 7.15pm pairs a wheelchair user and an able bodied person as dance partners. Don’t have a partner? The class will try and find one for you. This class is most suited to those who can push themselves in their chair. Classes run at St Mary’s School, Wintringham Road. Contact Katy on 07500 875060. Got the Strictly bug but can’t find a class to suit you? New, fun, social session with easy routines that can be danced using a chair, mobility aid or standing. All ages, conditions and abilities catered for. Come along and bring your family and friends. All you need to do is to book your place through lisaucan@msn.com then turn up and give it a try! 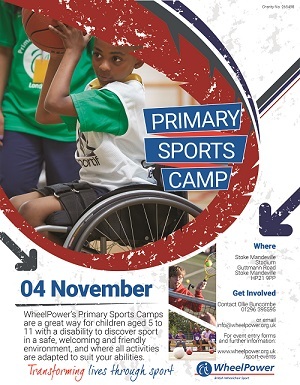 Bookings are now open for the WheelPower Primary Sports Camb in Buckinghamshire on November 4. WheelPower’s Primary Sports Camps are a great way for children aged 5-11 with a disability to discover sport in a safe, welcoming and friendly environment and all activity is adapted to suit your abilities.The Camps are a great way to make new friends, improve your health and have fun. Time: Registration is from 9.15am and the camp will finish at approximately 3.30pm.